John Updike died today at the age of 75. * That’s a good statistical age. It sounds like an average lifespan; like a neat round American age. He was in many ways a penultimate American, a writer in love with the American idea. The New York Times has an old page (from 1997) that includes links to two NPR Fresh Air interviews with John Updike, as well as articles including reviews of his books. Updike was an incredibly prolific writer. In his later years he focused on serving as an art critic and essayist. He wrote poetry, too. His most famous poem is “Player Piano,” which the New Yorker published in 1954. It was in 2000, upon reading “Rainbow” in The Atlantic, that I first observed, however, that it seemed like he was writing poetry to stay in shape for writing novels. Taken together, his Rabbit series may well be considered an epic prose poem on the later half of the twentieth century in America. That is the place to begin if you’ve never read much (or any) Updike. Grab Rabbit, Run and go. 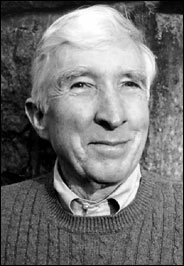 John Updike helped me immensely as I struggled through adolescence and early adulthood in suburban America, not because he had advice but because he was wise enough to understand and articulate in story what it was I was living in the midst of. He was a Central Pennsylvanian (he grew up outside Reading), and so was I, and yet I would have felt the connection if I was living in suburbia anywhere else in the country. I am happy, even in this moment, to quote The Simpsons—”Shut up, Updike”—because I am confident he will never shut up. His work will speak to generations to come. It is already a part of the canon of great American literature. Thank God: There is some justice yet in this world. John, we will miss you. Thank you for everything. Thanks, Dan, for this beautiful tribute to a magnificent author! Nice revision as well as nice tribute!